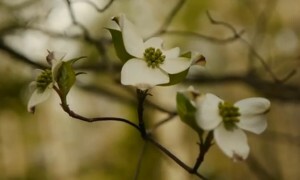 It’s the 64th year of the Spring Wildflower Pilgrimage in the Smoky Mountains. The wildflower bloom appears to be peaking with perfect timing for the thousands of wildflower devotees from all over the world who come to the Great Smoky Mountains National Park area at this time of year. It’s a unique biosphere filled with over 1,500 different forms of flowering plants. And this is its magical time of year, when spring has woken up the energy of all growing things, but before the trees have had a chance to leaf out and block the sun with their abundant foliage. This brief moment, lasting a little into May, is the time of the forest floor. Things will sprout and bloom in the spring sunlight and then die away in the shade of approaching summer, and not be seen again until next year. At this time of year we remember why the most visited national park in the USA is also sometimes referred to as “Wildflower National Park”. During the five-day period of the Wildflower Pilgrimage, participants will attempt to see as many of these rare and beautiful species as possible. Almost 150 events are planned for the occasion, from outdoor events in Great Smoky Mountains National Park to indoor events in Mills Conference Center (Pilgrimage HQ) in Gatlinburg, and Sugarlands Visitor Center at the Park entrance. This is the perfect time to take guided walks and hiking tours for all ages and capabilities. A time to let the many local and visiting famous experts open up our appreciation of all things Smoky Mountains, and especially this mostly hidden world at ground level. The Wildflower Pilgrimage website has all the information you need, including the 26-page (pdf file) brochure of the event. Facebook page here. Costs range from $15 to $75, and accompanied children under 12 are free. Online registration has ended but you can register by showing up at Mills Conference Center. You must be registered to take part, although there are some free events in the evenings, some especially good for kids. Also on Wednesday April 16 the kick-off luncheon is $25 and open to the public. The Spring Wildflower Pilgrimage is a non-profit event formed from the collaboration of several area organizations and made possible by the contributions of many individuals who donate their time and resources. Cabins of the Smoky Mountains is pleased to be a sponsor of this unique area event.